Maybe celebrate is a strong word. It's difficult to celebrate a 75 win season, but beggars can't be choosers. 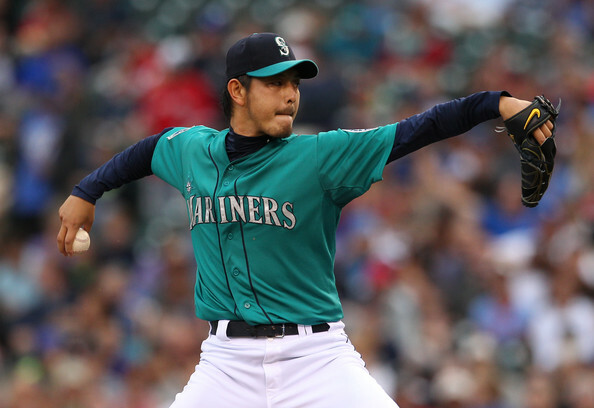 One of the bright sides for the Mariners this past season was a 31 year old pitcher by the name of Hisashi Iwakuma. They signed him for a measly $1.5 million (plus incentives that were never met) for one season and Iwakuma delivered more than his fair share. For that amount of money, he could've coasted for the season and gone back to Japan if he so chose. But no! He pitched brilliantly despite not having the big paycheck all of us can only dream about. Damn you Barry Zito. And yes, that's all crap. Facts and other stuff? If you insist. Generally, baseball players are competitive by nature and winning is a good thing in their eyes. I'm not saying all of them are competitive, but in this particular instance, I don't think I'll have rocks thrown at me for saying so about this player. Iwakuma wanted to pitch in the major leagues here in the states, and by golly he was going to prove he could do it. Or he visited Camden Yard and whatever magic was over there before the season rubbed off on him. For all I know, when he went into his windup he cast a spell that caused batters to gaze upon their worst nightmare and they cowered at the plate. He sure didn't impress in spring training last year though. At least, not enough to slot in to the starting rotation out of the gate. Remember the beginning of the season, when Wedge used Iwakuma only after Wedge had bamboo sticks jammed under every single fingernail? Iwakuma did say it helped ease him into the swing of things on this side of the pond against these kinds of hitters, but it would've been interesting to see what he would've done given an entire season. And now we can! Friday evening, if you haven't heard by now, the Mariners signed Iwakuma to a 2 year contract worth $14 million. $6.5 mil each year in 2013 and 2014 with an option for 2015 at $7 mil or $1 mil buyout. Considering what he did as a starter last year, that's a bargain. In 16 starts, he kept his ERA below 3 in 95 innings. He struck out 78 and walked only 28, so hurray for that. Let's just hope his shoulder holds up. And yes, I'm knocking on wood furiously as I typed that sentence with one hand. I left it in there because as you go about your day, that should be in the back of your mind in a haunting manner, like you've forgotten something and can't quite remember. That and I thought I'd mention it, in case anybody hadn't remembered he had shoulder trouble over in Japan. Iwakuma will never be an elite level starter. He is what he is, which is a decent 3 or 4 starter that will strike out a few guys, walk even fewer and throw 6 or 7 innings every start. For the contract he was given, I don't think anybody can complain. Just to give you an idea, courtesy of Cot's Contracts, Joe Blanton made $8m, Jon Lester made $7.625m, Hiroki Kuroda made $10m, C.J. Wilson made $10m..... I could keep going, but hopefully I've made my point. If not, I really don't know what we're going to do with you. So far, three spots in the rotation for the 2013 season are set. We have Felix Hernandez, Jason Vargas and now, Hisashi Iwakuma. None of the other starters are locks, so we shall see how things shake out. Not literally of course. I don't imagine shaking pitchers is a good idea, especially when most can hurl a projectile at your head faster than a vehicle travels on the freeway.